Be the first to share your favorite memory, photo or story of Heriberto. This memorial page is dedicated for family, friends and future generations to celebrate the life of their loved one. Heriberto was born March 16, 1945 in Sebastian, Texas to Juan and Virginia Moreno Landa. He was raised in the Blair area. Music was very important in the Landa household, Heriberto and his brothers formed a band "Conjunto Landa". 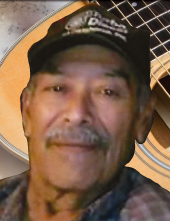 Heriberto played the guitar and sang in the band. Later on when he had children, his sons joined the band. He worked as a Laborer at local cotton gins. Besides playing music he enjoyed spending time with his children and grandchildren. Heriberto is survived by his sons; Juan Landa, Micky Landa, Ricky Landa; Daughter; Gloria Landa, Brother; Felip Landa; sister; Santos Avila, many grandchildren, and many many many great grandchildren. He is preceded in death by his life partner; Aurora Martinez, Father; Juan Landa, Mother; Virginia Moreno, Sons; Heriberto Landa, Jr. Brothers, Roman Landa, and Eutiquio Landa. Funeral services will be 2:00 P.M. Friday, March 22, 2019 at Lowell - Tims Funeral Home Chapel, Altus, Oklahoma. Interment will follow at Blair Cemetery. To send flowers or a remembrance gift to the family of Heriberto Moreno Landa, please visit our Tribute Store. "Email Address" would like to share the life celebration of Heriberto Moreno Landa. Click on the "link" to go to share a favorite memory or leave a condolence message for the family.